A Halloween-set horror anthology that will leave you speechless! Videonomicon asks you to take off your mask, pick up that candy, and get ready for a Halloween-themed horror anthology unlike anything you've seen before. After stumbling upon the graves of three murdered trick or treaters, a small town paperboy discovers a series of handwritten horror stories tacked to the children's headstones. Penned by a deranged pulp author driven mad by his craft, the stories chronicle grisly tales of Halloween rites, rituals, and traditions. Absent of dialogue and heavy on atmosphere, 3 DEAD TRICK OR TREATERS is an engrossing visual feast that turns the genre on its head and offers terror and suspense amongst the blood and candy corn! Hot off its success on the international film festival circuit and independent worldwide theatrical tour Videonomicon brings you this new horror hit in a limited edition Blu-ray/DVD combo featuring a wealth of special features. For fans of horror anthologies like Creepshow and Trick 'r Treat! 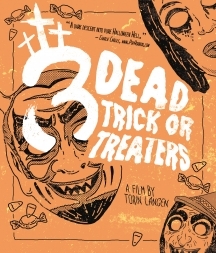 3 Dead Trick or Treaters is a dark descent into pure Halloween Hell.